Michael Jordan is a living NBA legend who has played the game of basketball better than anyone and that is what has solidified him as an NBA Legend. It’s no secret that he gives his all on the basketball court. As the owner of the Charlotte Hornets he is still giving his best on the court as well as giving his best in the Charlotte community! 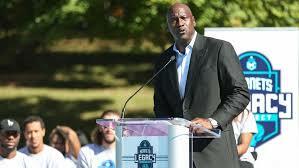 Michael Jordan gives big philanthropy gifts! Jordan is giving his best by helping people in the Charlotte Community to receive healthcare. The $7 Million dollar donation is to help open the Novant Health Michael Jordan Clinics which are slated to open in the year 2020. It is said to be the largest philanthropical gift bestowed by the legend to date. Jordan has previously given $5 Million to the National Museum of African American History and Culture and he also pledged $1 Million to the NAACP Legal Defense Fund and the Institute for Community-Police relations to help foster better communication between the community and law enforcement. The purpose of the clinics is to help people in the poorer parts of the city of Charlotte to have access to and receive good healthcare. Jordan has partnered with Novant Hospitals to open two clinics in North and Northwest Charlotte areas. Posted on November 4, 2018 by Celebrity Charity. Tiger Woods Charitable Foundation helps underserved youth! Tiger Woods is undoubtedly a living golf legend. Just his presence at a golf tournament can create a rockstar frenzy response in people. Because of his multiple golf winning titles and his professional golf game savvy, He has undoubtedly changed and enhanced the sport of golf forever. Tiger woods has also positively effected many lives through his commitment to his Tiger Woods Foundation. The Tiger Woods foundation which was founded in 1996 was founded to positively impact underserved children in communities by providing young people with educational enrichment opportunities. The foundation was started by Tiger who had a love for physics and math. Woods, is a self proclaimed STEM guy and his foundation focuses on STEM, the Education of Science, Technology and Math. Everyone from Sports Franchise and Businessman “Mark Cuban” to Rock Music Royalty singer “Kid Rock” to Country Music Superstar Darius Rucker loves and supports the Tiger Woods Foundation ad its various programs. The Tiger Woods foundation has consecutively won the coveted Charity Navigator 4-Star rating three times from the Charity Navigator, a respected charity evaluation organization. This award is like the Emmy Award of charities. According to Charity Navigator Founder, John P. Dugan, “Only 12 percent of charities have made this achievement.” Which means that the Tiger Woods Foundation’s programs outperforms most charities in the country. Visit www.Tigerwoodsfoundation.org to learn more about the great charity work being done by Tiger Woods Foundation. Carolina Panther's Thomas Davis Defending Dreams Foundation Charity Golf Event! Thomas Davis of the NFL Carolina Panther's franchise held his First Annual Celebrity Golf event to raise money and awareness for the Thomas Davis Defending Dreams Foundation (TDDDF). Celebrity Athletes from all over the country came out to support Thomas Davis's First Annual Golf event. The TDDDF does a lot of programs throughout the year to help children. This three day event began with the Thomas Davis and some of his fellow friends and teammates visiting the Levine's Children's Hospital to visit children suffering from various medical conditions. After their hospital visit, the big-hearted football players made a surprise visit to various schools around the Mecklenburg County School System to visit students to encourage them to stay in school and excel in school and life. On day three, the Celebrity Golf Tournament commenced on a wonderful course where players and guest played an exciting game of golf. Prizes were given to the players at the end of the event. The Thomas Davis Defending Dreams Foundation's Car & Bike Show is Coming up in Charlotte, North Carolina on July 9, 2016. See you there! Posted on May 29, 2016 by Celebrity Charity. He has the world at his fingertips and he wants to share his world with others. That speaks volumes about the character and personality of Josh Norman, a cornerback for the NFL's Carolina Panthers. Norman has been using his STAR POWER to win on and off the field. Norman and his Starz24 team hosted a successful charity gala event to raise money and support for the various programs that his Starz24 non-profit organization does for children. Norman, the sibling of 4 brothers wants to make sure that he is doing his part to give back to the community and to give children an opportunity to have positive outlets where they can be active children, stay out of trouble and develop teamwork and discipline. Norman's Starz24 has hosted celebrity basketball events, Fun Day activities for high school students and has been a guest speaker to talk to students about the value of hard work an dedication. Posted on June 6, 2015 by Celebrity Charity. Steven T. Benedict uses his Star Power to Help Children! Celebrity Athlete Steven T Benedict uses his Star Power to Help raise awareness for the Children's Miracle Network Hospitals. Celebrity athlete Steven T. Benedict joined forces with other celebrities to raise awareness for Children's Miracle Network Hospitals. Steven T. Benedict is a professional track and field athlete, fitness personality, and motivational speaker from Southern California. While track is his main athletic focus, he is also accomplished in many other areas of sport, from martial arts, to football, to soccer. Despite his laser focus on the track, he still takes time to give back. Benedict joined celebrities in TV, film, music and sports to raise awareness for Children's Miracle Network Hospitals (CMNH) "Put Your Money Where the Miracles Are" event on May 14, 2015 in Hollywood, California. The event was hosted by Children's Miracle Network Hospitals (CMNH) and Co-Founder Marie Osmond. Actress, musician, American Idol judge and long time supporter of Children's Hospitals, Jennifer Lopez surprised the patients with a special appearance. The star studded and magical celebration was well attended by celebrities such as Jennifer Lopez (actress/singer), Marie Osmond (singer/actress), Dan Bucatinsky (drama series Scandal), Fran Drescher (TV Land "Happily Divorced"), Kenny Lattimore (singer), Brian McNight (singer), Jen Lilley (ABC soap General Hospital), Katrina Law (Starz TV "Spartacus"), Steven Benedict (Athlete) and many others. Children's Miracle Network Hospitals (CMNH) patients and their families enjoyed the sea of gifts presented by sponsored brands such as AQUAhydrate, Children's Hospital Los Angeles, Children's Hospital Orange County, At Paul Mitchell the School Pasadena, Pound Puppy, Tag Along Teddy, The Coffee Bean & Tea Leaf, TONKA, to name a few. Posted on May 25, 2015 by Celebrity Charity and tagged Deborah Griffin Jermeca Jennings Tammie Tolbert. Thomas Davis Defending Dreams Foundation Charity Event "The Great Gatsby"
The Carolina Panthers and NFL's "Walter Payton Man of The Year Award" recipient and the Founder of The Thomas Davis Defending Dreams Foundation, Mr. Thomas Davis, really goes all out for what he believes in. Thomas Davis and his Wife Kelly, hosted a charity fundraiser for their 501 C3 Non-profit organization. The event entitled, "The Great Gatsby," raised funds and awareness to assist the foundation in providing positive programs for children. The TDDDF strives to help and encourage students to develop the life and social skills that will help them develop into productive and responsible citizens of tomorrow. 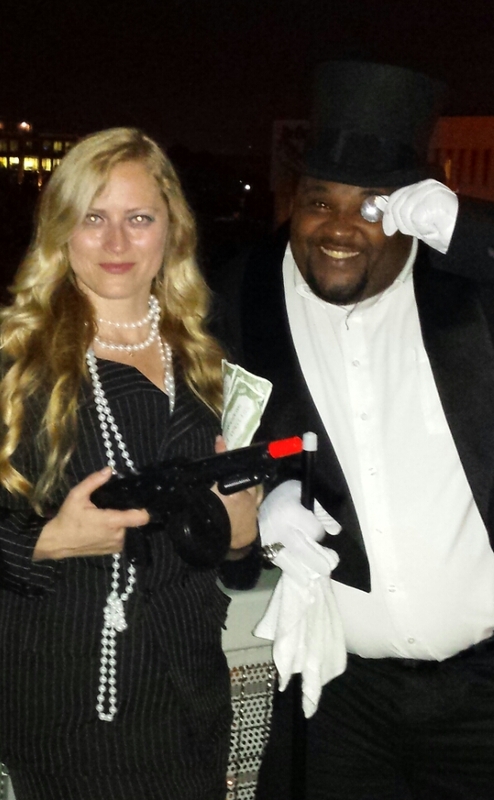 There were many NFL Teammates and supporters in attendance at the TDDDF "The Great Gatsby" event. Carolina Panther's teammate Josh Norman was decked out in a Top Hat, Black and White wing-tipped shoes and a gentleman's cane and looked so good he would put the board game Mr. Monopoly Man on to shame! Captain Munnerlyn from the NFL's Minnesota Vikings was present to show support for the TDDDF cause and looked very distinguished. Luke Kueckly, Thomas Davis's teammate was also dressed impeccable and had a winner smile to top off his "Great Gatsby look. Many of the women captured the fundraisers theme for the evening by wearing pearl necklaces, shimmy dresses, sequins and feathers to help match and set the scene! Felicia and Herb Gray were present to show their support as well as numerous other patrons. During his interview Coach Ron Rivera stated that he was extremely proud of Thomas Davis and all that he has done off the field for the community. The event was held at the Harvey Gantt Center and event tables and black jack tables were available for people to play games on every level! 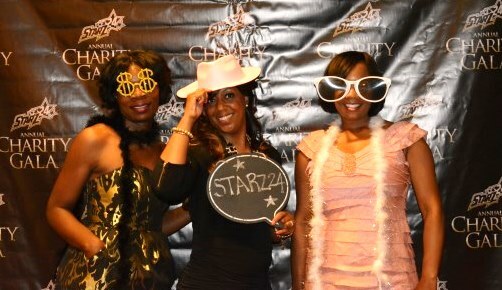 It was a great night of adult fun and it was a great event to bring awareness and funds to a very worthy cause! For more information on The Thomas Davis Defending Dreams Foundation, log onto www.defendingdreams.org. Posted on May 23, 2015 by Celebrity Charity. Although he never played for any professional sports team, he could have easily been an Athletic Angel and to many he was. Many professional sports players and coaches as well as his family, friends, associates and coworkers were saddened to find out that the charismatic, funny and professional sportscaster died from cancer. He fought cancer as tough as any team fights against its opponent. Even as he fought this terrible disease, he did so with so much class, dignity and integrity that many did not even know he was in such a battle for his life. Life. That is one of the things that Scott Stuart had. He had life in his eyes and in his heart. He lived almost everyday of life to the fullest. I remember when I first met Scott. It was at a charity event for inner city children. The Behailu Academy children's center in Charlotte, North Carolina was opening and Scott was there to make sure he gave support to the children and to his friend Dee-Dee Mills. During our Celebrity Charity Magazine interview, Scott talked about how he would not have missed this chance to be at his friend's grand opening because programs like Dee-Dee's were needed in the inner city. He mentioned how his parents were able to put him in various after school programs, but other children are not so lucky and he wanted to use his presence or what I like to call "Star Power" to bring awareness to this program for the children of the The Behailu Academy. That night his charisma and positive energy was so evident and uncontainable. He spoke to all the guest, took photos and gave one hell of a speech about his love for children because he too was a father....a proud father. He is no longer here on this Earth in the physical form....but believe me, through all the lives this wonderful man touched, he will go on to live multiple lives because of the way he lived his life. He set so many examples of what it is to be a professional, a friend, a father, a co-worker, and a caring human being. Cancer took his physical body, but not his spiritual body. He beat cancer. Do you know how? Well, his words can tell you best, "When you die, it does not mean that you lose to cancer. You beat cancer by how you live, why you live and in the manner in which you live." Enough said. Posted on January 8, 2015 by Celebrity Charity. Celebrity Charity Magazine was honored to be invited to come out and cover the great work that is being done by The Chris Canty Foundation regarding support for child literacy. The Chris Canty Foundation hosted a Women for Literacy Book Fair event at Barnes and Nobles in Charlotte, North Carolina to bring awareness to the importance of supporting children and literacy programs. Book Author Yesenia Hernandez was present to show her support for the foundation and for the foundations founders, brothers Chris and Joseph Canty. Supporters were able to purchase a book and part of the proceeds from the books purchased were donated to the Chris Canty Foundation. The National Association of Professional Women, Chili's, Chic-Fil-A and Massage Envy were some of the events great sponsors. It was a great and successful event. It is important to the foundation to enhance the total development of youth and the educational component touches an important part of the Foundations mission.To learn more about the Chris Canty Foundation, log onto www.chriscantyfoundation.org. Posted on December 7, 2014 by Celebrity Charity. Justin Tuck is an NFL Star who makes it his business to help the future stars of tomorrow by helping provide books and financial means for them to get an education. Tuck, who made A's and B's while playing sports, respects the value of a good education. Tuck and his wife Lauran founded Tuck's RUSH ( Read, Understand, Succeed, Hope) for literacy to help underserved schools with grant money and books to help encourage children to dream and reach for the stars. We all know it takes money to get an education. The Tucks took their concern and generosity and partnered with 1:1 Fund and the Children's Aid Society and provided $150,000 of their personal finances to open college savings accounts for young students in New York City. The endowment the Tucks have established will allow the students to have $100 each into their student account and then match the contribution from their family's up to $100 a year until the child completes high school. It is easy to see why Tuck and his family are a success on and off the field! The Chris Canty Foundation Gives Direction to Children! Another Athletic Angel, NFL player, Chris Canty, has a remarkable charity that really gives help and direction to youth in North Carolina, New York City and Bermuda. The organization, “works to enhance the total development of all youth,” According to sources. “When we work together, we can move communities forward and empower those in need,” states the organization’s website. The non-profit also provides current information on ways to provide assistance and opportunities for children. The Chris Canty Foundation is about giving back to youth and nurturing them to become positive and productive citizens. Sports play a big part as a platform to help children achieve goals, develop talents, self-confidence and necessary life skills. The Chris Canty Foundation works hard to provide the necessary tools to help develop children into successful adults. In Charlotte, North Carolina the Chris Canty Foundation held a charity event to raise funds for the non-profit organization and people from all industries and backgrounds were in attendance to support this diligent organization. Joseph Canty, the President and CEO of the Chris Canty Foundation hosted the evening at an upscale facility called “Blue” to ensure that all supporters had a wonderful evening and were shown appreciation for their support of the Chris Canty Foundation. The fundraising evening included a silent auction of sports memorabilia, paintings and travel opportunities for the bidders. The Dessert Specialist Sadruddin Abdullah also prepared exquisite chocolate confections for the event and donated a wine and chocolate pairings for 6 for charity supporters to bid on. Raphael Sabastian a co-organizer of the charity event as well as an Advisory Board Member of The Chris Canty Foundation stated, “We wanted to corral 200 to 300 hundred of our charity friends to mix and mingle and bring the charity to the city. We want people to see the A Class charity they support. I came aboard the Chris Canty Foundation years ago. When I worked for CoCa-Cola, I supported the charity as a sponsor. The people that I inherited the job from mainly wrote checks. But I wanted to “inspect what I expected.” I went out to see what they did and I was absolutely amazed. Chris Canty had paid out of his own pocket to have 35 professional, name brand athletes to direct over 300 children during the Chris Canty Camp. The kids weren’t charged a dime. Chris has an amazing heart. I saw the value year after year of working with him. We began to talk collectively about institutionalizing his work, and the Chris Canty Foundation was established. Every since we have been building the brand and have been blessed to have the community rally around this charity. Shirley L. Canty, (The long version of the name MOM). Chris and Joseph Canty’s mother, Shirley L. Canty, is proud of the work that her sons have done since the charity’s launch on June 17, 2011. “I think that Joe has done an excellent job as CEO and Chris has done an excellent job as Founder. The Chris Canty Foundation is young and growing and has upward mobility. Joe and Chris are true to the mission of the charity to plant seeds in good soil to really help young children and youth to dream about their future and to know that there is a positive person within each one of them. Chris is excited about what he has dreamt since given this platform of being in the NFL and he has refused to take no as an answer when it comes to being true to his mission which is to really promote the well-being of children and youth. I am really proud of the Chris Canty Foundation. She also stated, “They have always been entrepreneurs and community driven. “Chris and Joe would sit at the dinner table when they were 6 and 9 years old and talk about being entrepreneurs and giving something back to the community. They would say, “We will get a barber shop and an ABC store.” Well, everyone can see that they have gone well beyond obtaining a barbershop and an ABC store. Posted on October 13, 2014 by Celebrity Charity.